"So much hard work goes into the creation of a quality sermon, and upon its completion, it will be forgotten by some, remembered inaccurately by others, and cherished forever by a few. That is why it is such a blessing that Rabbi Irwin Groner, one of America's leading Conservative rabbis, has collected his sermons in book form so that we can all have access to them." "This wonderful collection of Rabbi Groner's sermons is inspirational and instructional. His teachings on faith, family, freedom, forgiveness, and the future are universal in their appeal and will touch the hearts and souls of people from every faith community. His sermons give us reasons to hope, questions to ponder, and inspiration to make ourselves and our communities better. Through these discourses, Rabbi Groner opens the doors of the synagogue for all to enter and experience a greater understanding of and appreciation for Judaism." "Rabbi Groner's sermons speak 'from the heart to the heart.' They speak directly of the transcendent human yearnings for understanding and connection, for brotherhood and peace. The rabbi's words demonstrate his remarkable ability to understand our innermost fears and needs. The reader is then inspired to share in the author's vision: that our response to injustice and cruelty should not be rebellion, but faith in the power of each of us to help repair our battered world. Rabbi Groner's compassion and wisdom will help us live more courageous and worthy lives." A good sermon is an art, as much in the way it is put together as delivered. 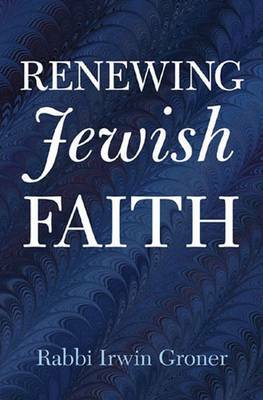 Renewing Jewish Faith is Rabbi Irwin Groner at the top of his form, and this moving, insightful, and lucidly written collection offers observations on Judaism and a lively presentation of the values of the Jewish faith. The focus of Rabbi Groner's sermons is the central importance of the synagogue in the renewal of Jewish life-it is the institution in which Jewish values achieve permanence. He often argues that human nature cannot be understood exclusively in secular terms and that the religious dimension of human existence must be understood as the basis by which life itself acquires meaning. In this spirit, Rabbi Groner's sermons give voice to both the optimistic and pessimistic opinions about the future of Jewish life in the free world. Groner addresses basic issues confronting Jewish beliefs and tradition in contemporary life. After the first section, "Folk," the book goes on to address faith, family, freedom, forgiveness, and future with sermons such as "When Life Is Not Fair," "On Attaining Maturity," and "The Challenge of Freedom." Whether you are familiar with Rabbi Groner's writings or not, Renewing Jewish Faith is a timeless contribution to the study of human nature and a must-have collection of some of his best sermons.